The Ozbek ethnic minority, with a population of 14,800, is scattered over wide areas of the Xinjiang Uygur Autonomous Region. Most of them being city dwellers, the Ozbeks live in compact communities in Yining, Tacheng, Kashi, Urumqi, Shache, and Yecheng. The Ozbek people have frequent exchanges with various other ethnic groups in Xinjiang, and have particularly close relations with the Uygurs and Kazaks. The Ozbek, Uygur and Tatar languages all belong to the Tuskic branch of the Altaic language family and are very close to each other. The Ozbek script is an alphabetic writing based on the Arabic letters. 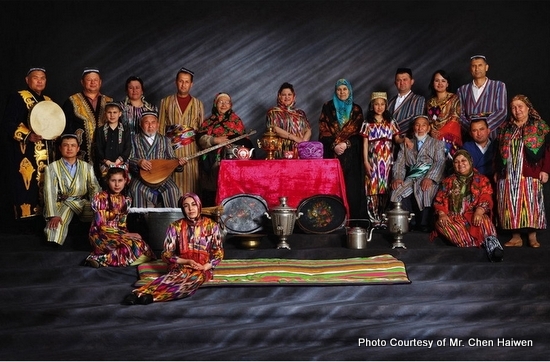 The Ozbeks believe in Islam, and their customs, dressing and eating habits are basically the same as those of the Uygurs. Both men and women wear skull caps with bright colored embroidery in unique patterns, and some are made of corduroy or black velvet. Women sometimes wear scarves on top of their caps. Men wear buttonless robes reaching the knee, with oblique collars and the right side of the front on top of the other. The robe is tied with a triangular embroidered girdle. Women wear broad and pleated dresses without girdles. Ozbek men usually wear leather boots and overshoes with low-cut uppers. Women's embroidered boots are very beautiful and unique in design. The collars, front openings and sleeves of men's shirts are trimmed with colorful, patterned lace, which is typical of the handicraft art of the ethnic group. The Ozbek people like mutton, beef and horse meat and dairy products. Crusty pancake and tea with milk are standard fare for all three meals of the day, and they enjoy stewed meat with potatoes, honey and syrup. "Naren," a mixture of minced cooked meat, onion and sour milk, dressed with gravy and pepper, is a table delicacy reserved for guests. The Ozbeks eat it with their fingers.